The plans for Milton Road continue to develop. In July the Greater Cambridge Partnership Executive Board agreed an outline plan called the Final Concept. Then over the autumn and winter a number of workshops were held to discuss details of particular points, e.g. the Elizabeth Way roundabout, cycle paths. Next the Local Liaison Forum (LLF) is to meet on Tuesday 30th January to discuss issues arising from the workshops and where this leads in terms of design, what is likely to be changed, what needs to be done and what inputs are still required. This is an important stage, because after this the consultants will be tasked to draw up the preliminary design which is to go to the Board in June or July. Though we will be consulted again in this process, it is always more effective to get our wishes incorporated into the design at the start, rather than trying to get it changed later. So please come along and make your views known at the meeting of the LLF on Tuesday 30th January at 6.00 p.m. in Chesterton Community College. I look forward to seeing and hearing from you there. The meeting minutes for this year's AGM are available from the meeting minutes page. The following information was on the hand out in this year's AGM. See GCP web link above for details of these Design Group meetings. The County Officers and WSP Consultants will now work up detailed plans, taking into account the Workshop and Design Group feedback. These plans will then be presented to the Milton Road Local Liaison Forum (MR LLF) at a public meeting in January 2018 for residents and stakeholder comments. The Officers aim is then to take the Preferred Option design and outline business case to the Assembly and Executive Board in the March meeting. That will mean they need to get all the work done by the first week of February 2018 so the reports can be approved, edited and published in advance. They will be asking for approval from the Board to take this Preferred Option design out to public consultation, probably in May 2018. Following analysis of feedback from the consultation and any changes that may instigate, they will then need to go back to the Board in the Autumn of 2018 to present the outcomes and ask for approval to go ahead with the Detailed Engineering Design. The Assembly and Board meetings are open to the public who can ask a question if submitted three working days beforehand. Documents for these meetings are posted on the South Cambs website at least a week in advance, along with protocol for asking questions. See link via the GCP website on the Events Page for all meetings. Keep up to date on developments by following MRRA on Twitter and Facebook, by checking the GCP website https://www.greatercambridge.org.uk/events/ and the Milton Road project updates https://www.greatercambridge.org.uk/transport/transport-projects/milton-road/ and come to the GCP Assembly and Executive Board Meetings. But most important is to lobby the decision makers for the best possible design for Milton Road for future generations. Mitcham’s Corner. We are therefore hopeful that we can get these bus lane lengths reduced since we believe that this is valuable space that could be used for safer walking and cycling, segregated by a tree-lined avenue of trees and verges the whole length of Milton Road; a safer and more environmentally worthy landscape for one of the main gateways into our beautiful city. There have been two workshops recently, one on bus stops and pedestrian crossings and another on street trees. Attendance at these workshops was by application to GCP. Each workshop followed a similar format: An initial Presentation giving the tasks and parameters for the evening, followed by discussions in small groups. Milton Road was divided, either side of Arbury Road, for separate discussions and feedback. The GCP workshop presentation was given by Officers and the WSP Consultant and participants discussed preferred design type and location of bus stops and crossings along both sections of Milton Road. At this meeting the bus lane ran the length of MR unlike our Do Optimum plans. Presentations were given by the City Council’s Tree Officers who proposed a few tree options and Kieran Perkins, an urban realm architect, who presented ideas for a sense of place. Participants, in small groups, were asked to choose species for each section of Milton Road from the pre-selection offered. Afterwards the groups were allocated one of four potential public spaces for ideas on how these spaces should be used (Milton Road Library, Shop area near Arbury Road, Land by Woodhead Drive and the King’s Hedges junction). Check for Milton Road project updates on the GCP website and come to the GCP Assembly and Executive Board Meetings. But most important is to keep lobbying the decision makers for the best possible design for Milton Road for future generations. GCP’s current ‘Final Concept’ plans include a full length bus lane, albeit alternating between the north and south side. We believe a bus lane will not bring the desired modal change and at most only save a couple of minutes on the rare occasions when the traffic is queuing, before reaching Mitcham’s Corner. We believe that this is valuable space that could be used for safer walking and cycling, segregated by a tree-lined avenue of trees and verges the whole length of Milton Road; a safer more environmentally worthy landscape for one of the main gateways into our beautiful city. Just three councillors can vote to decide the fate of Milton Road. Please email them with your views. A joint partnership between MRRA, HPERA, and the Cambridge Cycle Campaign has resulted in the creation of the 'Do Optimum' alternative to the City Deal's 'Do Something' proposal. The new Do Optimum proposal has been discussed and a resolution has been passed by the Milton Road LLF to recommend the Do Optimum proposal to the City Deal board. A joint statement by the 3 groups has been released and can be found here. 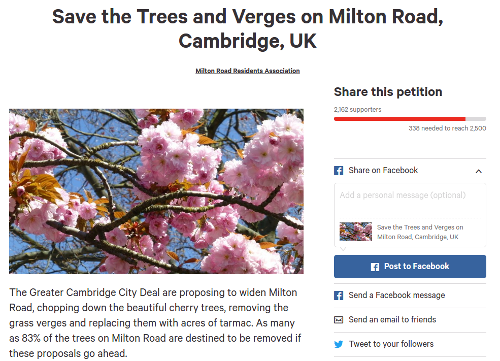 Cambridgeshire County Council required at least 3000 Cambridgeshire residents' signatures to debate the petition as part of a full council meeting. The online petition, along with our paper petition, has surpassed this goal. On 19th July 2016, the Milton Road Residents' Association Chairman presented the petition for discussion to the County Council. 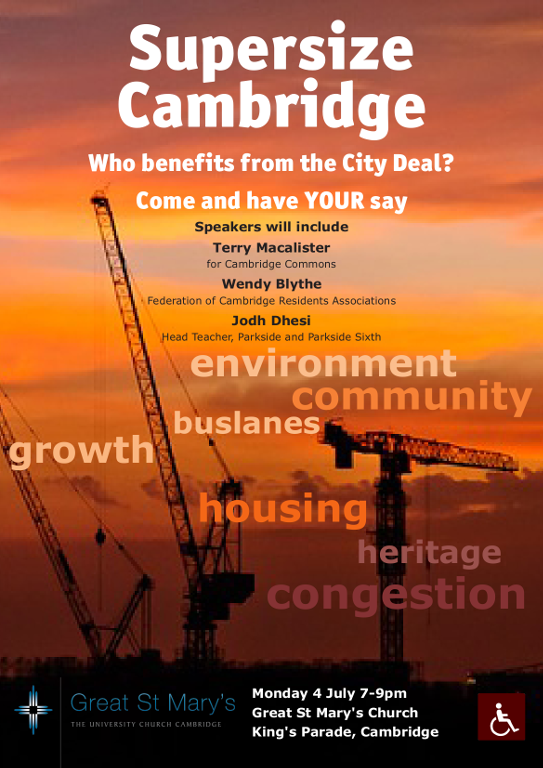 On July 4th 2016, people from all over greater Cambridge were invited to come along to give their views on the supersizing of Cambridge, its consequences for this beautiful City of Cambridge and its villages, its impact on those left behind in the rush for growth and to express their views on what they see as the singular lack of vision and lost opportunities in the City Deal's proposals. The executive Board has approved the road layout recommended by the City Deal. Watch the full video of the meeting here where the proposals were unanimously approved. The City Deal has proposed 3 lanes and in some places 4 lanes of traffic along Milton Road. They are also proposing to close Union Lane at the junction with Milton Road, banning right turns into Elizabeth way and also remove the Elizabeth way roundabout. More details of their recommendations can be found at the Milton Road Proposals section of this site.